The IVEK Digispense&eg; 10/RS232 Methadone Dispenser is a precision, high speed, low volume, positive displacement liquid dispensing system capable of the industries highest accuracy and repeatability. The wetted components include 99.8% pure Alumina ceramic piston/cylinder modules. These components are mated together to a clearance of 120 millionths of an inch. With only one moving part in the fluid path, systems have been operating for years without measurable wear. The dispenser is often used for dosing pharmaceuticals where inventory control and accuracy are critical. Ceramic pump parts capable of millions of cycles without measurable wear. 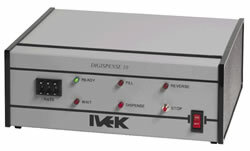 Easy to control from the RS232 interface. Factory-made tubing kits with bottle cap connections. Precision volumetric flask for accuracy checks. 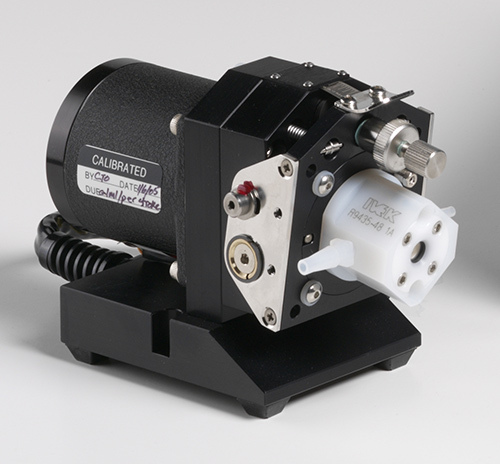 Factory pre-calibrated motor/base pump module.